Seaside Book Nook: Thank You for Flying Air Zoe! TLC Book Tour + Giveaway! Thank You for Flying Air Zoe! TLC Book Tour + Giveaway! My Rating: Must Read - 5 stars!!! Synopsis: Ladies and Gentlemen, the Fasten Seat Belt sign has been turned on, but feel free to ignore it, because sometimes life is best lived on its dizzy edges. Your cruising altitude today will be sky high, and you will be flying at staggering speeds as you travel alongside Zoe Tisdale, former Valley Girl and rock star turned bored butter saleswoman. On the heels of a brush with mortality, Zoe concludes that she’s been letting time pass her by. Realizing she needs to awaken her life’s tired refrains, Zoe vows to recapture the one chapter of her life that truly mattered to her – her days as drummer for The Flip-Flops, a spirited, sassy all-girl garage band that almost hit the big time back in 1987. But reuniting the band won’t be easy. The girls who were once the whiz kid guitarist, the prom queen bass player, and the hippie lead singer grew up and became women who are now a reclusive dog trainer, a wealthy socialite, and a sociopathic environmentalist. Will Zoe bring the band back together and give The Flip-Flops a second chance at stardom? Is it possible to fully reclaim the urgent energy of youth? As you follow this wild flight path, please know that your destination could be anywhere at all, complimentary oxygen is provided upon request, and baggage flies free. We hope you enjoy the ride, and Thank You For Flying Air Zoe. My Review: As I get older (and maybe wishing I could go back to my prime years), I am drawn more and more to books that reflect back on the 80's (even if I want to forget the hairstyles back then!). Thank You For Flying Air Zoe, took me right back down memory lane. 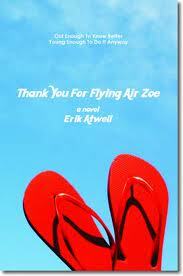 Since I loved everything about Thank You For Flying Air Zoe, I will write my review on the four main characters. I couldn't get enough of Zoe, Lauren, Ginger and Melinda. As Zoe tries to figure out her life, I couldn't help but laugh so hard. Zoe leaves her job as a sales person for organic butter, sells all her belongs, dumps her boyfriend (a great guy), turns down the latest teen heart throb, sleeps in a tree, becomes a nanny, and so much more, so she can find herself. Zoe's BFF, Lauren, since elementary school, has always been her rock and seems to be the most level head of her friends. When Zoe finds out that Lauren has been a closet guitarist (well storage facility, not closet! ), she is determined to get their high school garage band back together. Zoe has unfinished business to take care, which includes playing at Whiskey GoGo. "Ginger suddenly panics. “Ohmigod, how does my hair look?” “Seriously?” Lo says. “Sorry,” Ginger says. “Just a latex reflex.” “Latent reflex,” corrects Lo. “Latent,” Ginger repeats. “Got it.”"
"And not just any set of lockers, but our lockers from 1987. I pull the latch, and the locker door opens. “You still remember your locker combination?” Lo asks, as I turn the dial on the next locker. “36... 24... 34.” I say, and Ginger's old locker pops open. Ginger can only smile. “I guess I was blessed,” she says. " Melinda moved to the LA area as a freshman in high school and become the bands singer. She is a bonafide hippie (planetary crusader!). When she is attacked by a Northern Goshawk (who she is protesting for birds' rights) and falls out the tree, I thought I wasn't going to stop laughing. There are so many funny scenes with Mel. As the story unfolded, it continued to just get funnier. I would have loved to have had friends like these four. It is a FANTASTIC book, chick lit at its BEST! The most disappointing thing with Thank You For Flying Air Zoe is that it ended. Just like your favorite TV series, movie, book....you just don't want it to end. Speaking of movies, Thank You For Flying Air Zoe would be a hilarious movie. Thank You For Flying Air Zoe is a MUST read type of book. I can't wait for Erik Atwell's next book. I hope he is writing fast! Meet the Author: Erik Atwell started his writing career in grammar school, where a one page history class assignment ballooned into a forty page fictional account of a politically controversial silversmith in Boston circa 1776. Daring to follow up such an auspicious debut, he later graduated to short stories while living in New Hampshire, screenplays upon moving to Los Angeles, then finally novels when he ultimately landed in Seattle. He is currently gearing up to escape city life and return home to New Hampshire with his rock-star wife and eight month-old son, whose only musical claim to fame thus far is sleeping through an entire Go-Go’s concert. But in his defense, he was three weeks old, and the stage was a quarter-mile away. Thank You For Flying Air Zoe is his first novel, and he hopes to write a second novel before the little guy is old enough to read it. And yes, he was once in a band. For twelve minutes. GIVEAWAY: I am so excited! 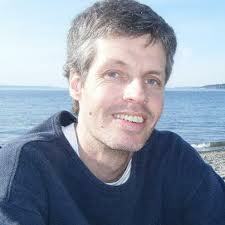 Erik has offered to give one lucky person a Kindle version of Thank You For Flying Air Zoe! All you need to do is leave a comment to this post (below) letting us know what your favorite 80's song is! Giveaway ends July 17th, midnight EST. Good luck! Purchase It: You can purchase Thank You For Flying Air Zoe at Amazon for $12.95 ($11.01 Prime members and $2.99 Kindle version). Connect: You can connect with Erik on his blog, Facebook and Twitter. Great review of a super fun book! I love anything by the Bee Gees! They were the greatest thing out of the '80's! I'm so glad you enjoyed this one as much as you did!